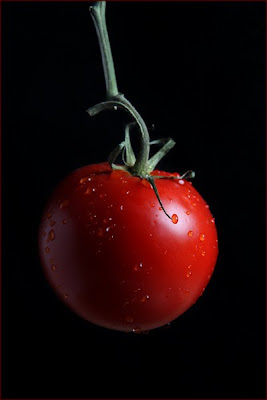 I have been asked a few times to explain how I have done a few of my photos for my 365 project. I thought I'd take the time to dissect today's image for all of you. 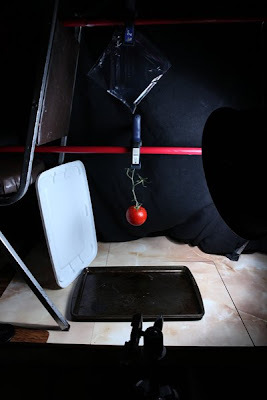 I then set up my tripod and camera with the camera slightly higher then the tomato. Once my camera was set up and locked down tight I turned my attention to focus and camera settings. After the proper focus was set I turned off the auto focus so it would not change when it pressed the shutter button. Now that I had everything in place I poked a hole in the bag of water and started shooting. I later repositioned the bag a little to ensure the water dropped evenly over the tomato. I did make the background a bit darker and added a thin stroke (boarder) around the image in Photoshop but that's about it for post processing. If you have any question leave me a comment below and I will do my best to answer it.